southern orders : EGADS, THE ADVENT WREATH IS LUTHERAN! SHOULD IT HAVE A PLACE IN CATHOLIC CHURCHES???????? EGADS, THE ADVENT WREATH IS LUTHERAN! SHOULD IT HAVE A PLACE IN CATHOLIC CHURCHES???????? One widespread tradition is the use of an Advent wreath both in the church and the home to mark each Sunday in the Advent season. While the origin of this as an Advent tradition dates back to the Lutheran church following the Reformation, the current form commonly used today was developed more recently and is used in many other Christian churches throughout the world. The wreath is made out of evergreens in the shape of a circle to represent eternal life. 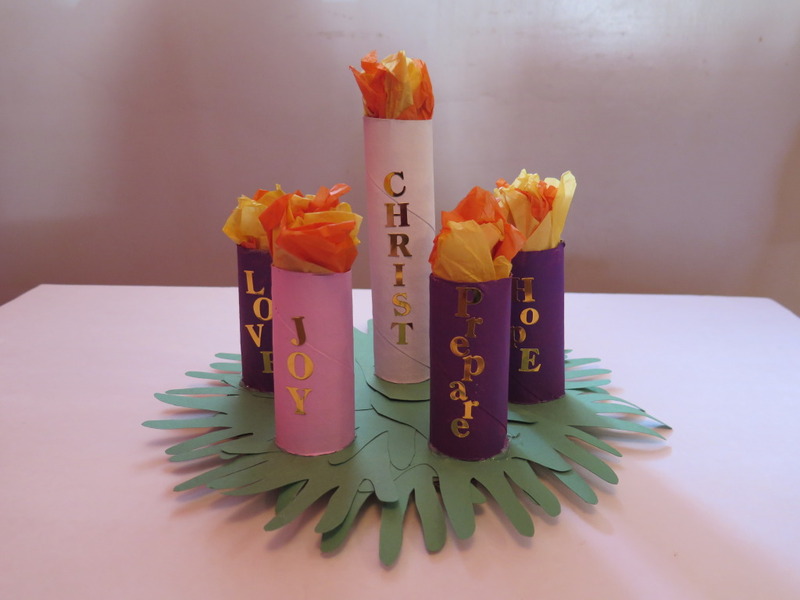 It consisted of four candles originally; three purple or blue candles to match the liturgical colors and one pink candle lit on the 3rd Sunday in Advent. This 3rd Sunday is known as Gaudete Sunday, meaning “rejoice” in Latin and comes from Philippians 4:4. Lighting this 3rd candle, Christians relax the fast to rejoice for the promised Messiah is coming soon. Many Advent wreaths also have a 5th candle, the Christ candle, which is lit during the time of Christmas, symbolizing that Christ, the light of the world, has entered the darkness. So now I discover that my pre-Vatican II parish in Augusta where I grew up was way ahead of its time ecumenically as were the two pre-Vatican II Catholic elementary schools I attended. Advent wreathes were set up in the sanctuary and in our classrooms as well as pagan Xmas trees at Christmas. And many of you will pass out over this. When I was at our Cathedral as the MC and then as pastor at the Church of the Most Holy Trinity in Augusta and also my first couple of years at St. Joseph in Macon, we would place a huge, and I mean huge, Advent wreath on the old high altar but hanging as a Xmas wreath would, not flat but upright. Then we would use four of the six huge candlesticks on either side with the proper color candles. What about that??????? In my pre-Vatican II parish, our pastor would put up two evergreen trees that looked like Christmas trees at Christmas but not decorated in any way. Poinsettias of course were used. Was there a prohibition prior to Vatican II to use decorated trees and use lights, white or colored? I can't think of the name of these now, but in my parish in Augusta, we would decorate a very large tree with homemade religious ornament symbols. I think this is Protestant too? We also used white lights! What that too secular????? 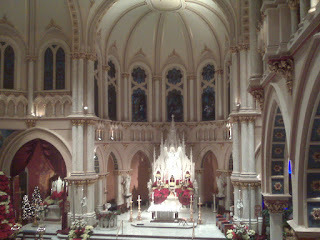 These are some Xmas decorations at St. Joseph Church in Macon when I was there. Were we too pagan and department-store like, thus having dialogue with the secular side of Xmas? And what about the fifth "Christ" candle for the advent wreath that is used at Christmas? Is this kosher in Catholic churches? As though there isn't enough Advent and Christmas anxiety, this all adds to my ever increasing inability to cope with all this anxiety in an ecumenical, interfaith and pagan world. Because, after all, the fundamentalists tell us that all things Catholic are Pagan, like Halloween, Christmas and Easter! I wonder how the SSPX feels about all these pagan, Protestant syncretizing influences in our Catholic churches? I like the tradition of the Jesse Tree, the one with home-made religious ornaments (symbols), especially for schools during Advent. It's very, very hard to push back against the utter absence of Advent beyond the boundaries of our Catholic world. Many (most?) Catholic groups begins singing Christmas carols early on, even before the Advent season starts. Fr Kavanaugh is spot on. The 'Advent Wreath' is a fairly recent custom, but its symbolism is apt and it is not liturgical. A Xmas tree in the sanctuary, or a crib, or the Christchild placed upon the tabernacle is not liturgical either. But they can be aids to devotion. The Tree of Jesse was common in pre-Reformation England. Unfortunately the protestant 'reformers' systematically destroyed most of late medieval art and only in a few years. One would have to fast forward to the 1960s to find such destructive iconoclasm. But this time the Catholic Church imposed it upon itself. We are still living with the results. I remember Advent wreaths as something in the home at about the time of Vatican ll. It’s apperance in church occurred later, especially the ritual lighting of the wreath as part of Mass. As part of a home, I like Advent wreathes. As part of Mass not so much. I have also noticed how that wreath can follow fads; from violators blue and from 4-candles to 5. I also always remember crèches as part of the Church. Often they would be surrounded by permanent evergreen trees, and they were often outside. Vandalism prevents that today. Evergreens decorated around a Church doesn’t offend me. Should the tree be in the sanctuary, I don’t know. I do remember that Christmas Trees were not to be decorated before Christmas Eve. Parish Priests used to make a point of reminding people of that. More offensive to me is the loss of both the Advent and Christmas seasons. I could also say that the loss of the season surrounding All Saints and All Souls is also sad. For that reason I do like that there is a wreath that quietly reminds me that Advent is a season. I wish there was something to remind people that the Christmas Season does not end on Christmas Day. That is just my opinion. Oh, tidings of Bradstreet and Dunn." WHICH ABNORMALITY IS ACTUALLY REAL AND VALID? OKAY! I ADMIT IT! I AM STAR STRUCK! I LOVE LUCY! SAINT LUCY THAT IS! CHANUKAH OR HANUKKAH, DO YOU CELEBRATE 🎉 IT? A NEW PURITAN SECT DEVELOPING WITHIN CATHOLICISM? I DON'T KNOW WHO CHRIS PRATT IS, BUT I LIKE HIM!